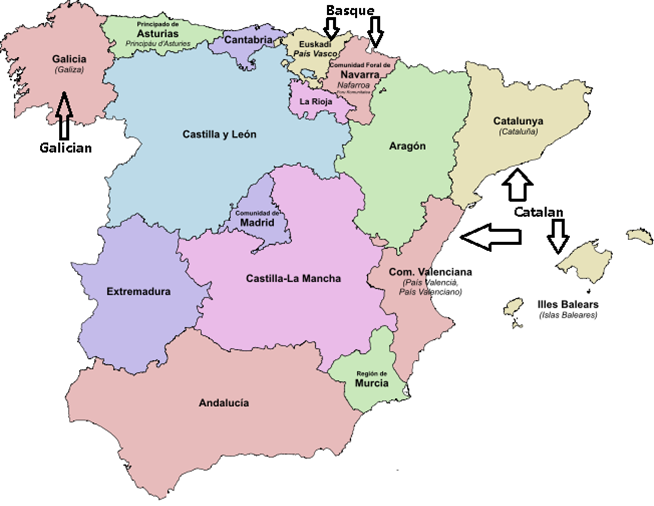 The main languages of Spain besides Castilian Spanish are spoken in the north of the Iberian peninsula, from Galicia in the west to the País Vasco and Navarra in the center to Catalonia in the east. Additionally, Portuguese territory occupies the western edge of the peninsula, and Catalonian is also spoken in Valencia, on its eastern edge. Modified from https://en.wikipedia.org/wiki/File:Autonomous_communities_of_Spain.svg under Creative Commons Attribution-Share Alike 3.0 Unported license. Castilian became the predominant form of Hispanic Romance because Castilians took the lead role in the Reconquista: the long process of retaking Arab-held territory, culminating in the conquest of Granada in 1492. As Ralph Penny summarized, “At first typical only of the speech of the Burgos area of southern Cantabria, Castilian linguistic characteristics were carried south, southeast and southwest, in part by movement of population, as Castilians settled in reconquered territories, and in part by the adoption of Castilian features by those whose speech was originally different.” This naturally left Galician, Basque, Catalan, and Portuguese remaining in areas that weren’t part of this takeover process. An animated map I found on Wikipedia has me wondering about the specifics of this process. It shows all the different forms of northern peninsular Romance pushing south, then Castilian spreading east and west at the expense of Leonese and Aragonese. I don’t know enough Iberian dialectal history to evaluate the accuracy of this narrative. Can anyone chime in? I’m particularly curious about the map’s depiction of the history of Portuguese. Was Mozárabe really the form of Romance spoken in today’s Portugal until the Reconquista? 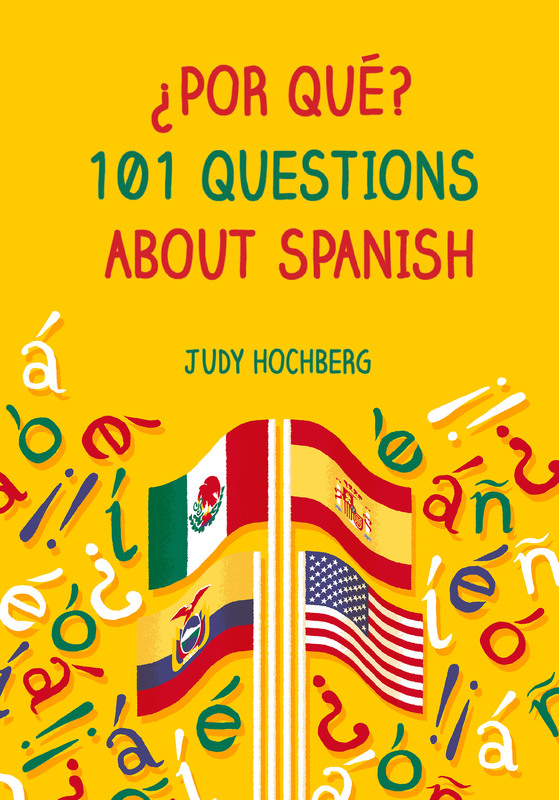 This entry was posted in From Latin to Spanish and tagged Catalan, Galician, history of Spain, Iberian Romance, Portuguese, Reconquista, Spanish, Spanish dialects on 25 May, 2016 by jhochberg. Mozárabe is just a name we use for all the Romance varieties spoken in the non-Christian areas about which we know very little at all, if anything. Mozarabic is not a language. So, yes, the spoke “Mozarabic” in those areas, but that just means that they spoke (varieties of) Romance, just like in the north, varieties that tended to blend into each other. And yes, the northern varieties had a strong influence in whatever remained of the southern Romance varieties (“Mozarabic”) after those areas were (re)conquered. That was in part because of some repopulation and in part because of the low prestige of the Mozarabic varieties. Also, we should remember that the differences between (adjacent) varieties were probably not that great. That’s how I see it anyway. I had somehow always assumed that Portuguese/Galician was already spoken in its current territory, but it certainly makes more sense for it to have come south along with Castilian and the other northern Romance varieties. We know so very little about Mozarabic… Commenting about the study of this language (or rather languages), Rafael Lapesa talks about “… la sensación de inseguridad que invade al estudioso de un mundo lingüístico en que nada parece imposible y es poco lo incontestable”. Therefore we cannot know for sure what happened to all those Romance varieties, and it’s far more likely that eventually the northern and southern varieties got mixed. In addition, taking into account the weight of 2 southern cities, Lisbon and Toledo, in the process of standardization of Portuguese and Spanish, it’s possible, even probable, that the southern Romance varieties (Mozarabic) were the ones contributing the most to the modern languages. Wow, *ortiga* makes a lot more sense than *oruga*. I’m not sure how that mistake got in there – and you are the first one to catch it. Gracias for this and your interesting comment about Mozárabe. In which the blogger hears from her favorite author!